(a) Remove the 2 bolts and 6 nuts. (b) Using a plastic hammer, remove the transfer assembly from the automatic transaxle assembly. 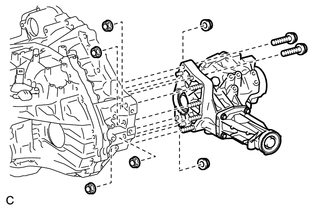 Remove the transfer assembly from the automatic transaxle assembly without tilting it. During removal, do not hold the transfer assembly by the oil seals on either side of the transfer assembly.